What would competing solely on information look like? And if you did battle competitors with information, is “engagement” the best way to do so? To understand when and how to compete with information, let’s walk through four simple competitive frameworks. First, consider that while we live in an age of information, few management experts consider it the basis of market competition. The classic tenant of marketing is there are just three ways to compete: product-focused, operations/cost control, or customer solutions. Each is a choice, and companies within the same industry with similar products can elect to compete on a different dimension. 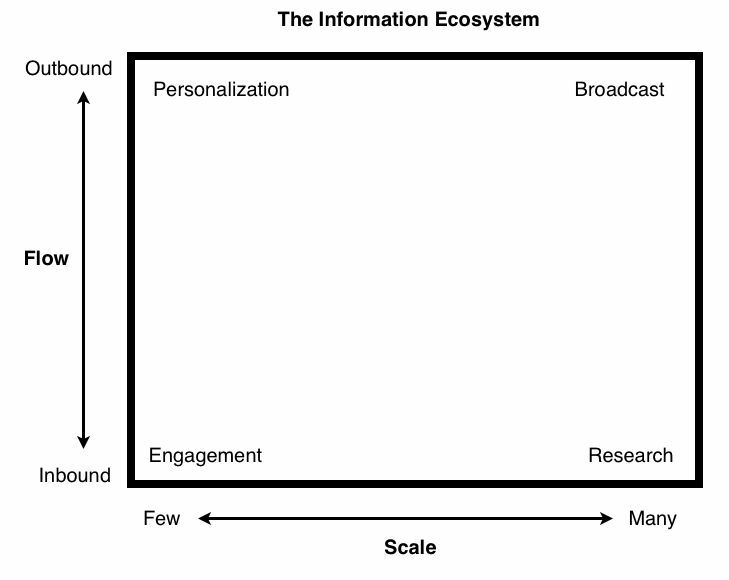 However, this old model misses a new competitive position: Information. Like a fish swimming in water not perceiving H2O around it, or early humans breathing air not realizing oxygen existed, for centuries businesspeople ignored the information flowing around their organizations; information didn’t really have a name until the 20th century. Upon our discovery, we then treated information as a simple fluid, like money or electricity, to be managed in inflows and outflows. 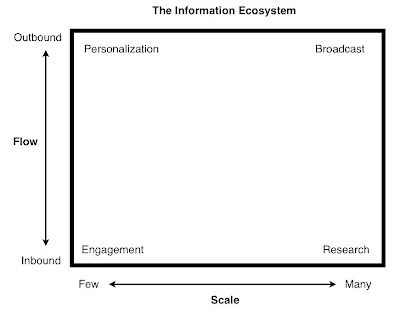 The rise of information technology systems in the 1990s sought to reduce the noise (waste) of information input and transmission, and accelerate the dissemination of output, but all the while information was categorized as a force, an ether, a thing, about as negligibly important to macro competition as paper supplies or office furniture. But in the past 20 years, information has become a vital, focal entity of its own. Information is no longer a subordinate throughput, but an end goal to be desired. Wired magazine co-founder Kevin Kelly writes in his brilliant book “What Technology Wants” that the interlinks of all technology tools — computers, car dashboards, GPS systems, bar codes, television programs, printed materials — have created a global network now with more complexity and contact nodes than the human brain. Kelly does not believe, as Ray Kurzweil does, that information is about to wake up in a singularity of artificial intelligence, but he does note within computer networks a small percentage of digital traffic has no identifiable originating source. Our global information system is talking to itself. Something in there is going on. Information, at some level, has come alive. Demand is the magnet pulling information forward. Consumers around the world have a seemingly limitless hunger for more content. In the United States, television is still king, with the average human watching 4 hours and 44 minutes a day; mobile and Internet and social media use is rising, but rather than eclipsing TV and radio, those new digital streams are additive, with consumers taking in or sharing from more than two information devices at once. Office workers are migrating to 2 computer screens. The typical U.S. home has 3 television sets. We can’t get enough information, and now with YouTube and iPhone videocams and Facebook, we’re creating our own. In this chaotic information explosion, confusion reigns. ABC, NBC, CBS and Fox were first challenged by cable, and now by millions of video streaming options on Netflix, Hulu, YouTube, Google and Amazon. Businesses have the opportunity to become leaders via information dissemination with tactics such as “content marketing.” Individuals can arise quickly to become “thought leaders,” gurus, new nodes on the information playing field. Information is no longer a commodity like electricity or cash to be flowed and managed, but a choice for strategic warfare. Google, Apple, Netflix, Amazon, Zappos, Oracle, HP, SquareTrade, Ford, Tesla, AT&T are all companies competing with layers of information that help set their products apart. You don’t have to be in the information business running a search engine to use information to attract consumers; you can instead position yourself as the information leader in your space to add a new electromagnet for customer attraction. Competing on information is why our agency Mediassociates has this blog and why I spend late nights writing columns for Bloomberg Businessweek. 2. Scale — whether information is best deployed to a few or to many. 1. Broadcast. 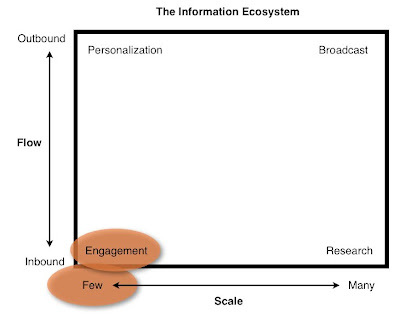 At the top right of the information flow/scale quadrant is broadcast, where information flows outbound to many parties. ABC, CBS and NBC were kings of this in the 1970s, but you’re likely broadcasting yourself if you use Twitter to send out “please click my blog post link” to 3,000 followers. Broadcast is a one-way ticket out, a selfish attempt to push a single message to as many people as possible. You need broadcast if you want to influence many to do one thing, or get many to receive one idea. The advertising industry, Hollywood, and yes, most social-media gurus are built on this model. Broadcast gets knocked about these days, but it is one of four completely valid information strategies, because at some point any organization has to influence the vast network around it. 2. Personalization. 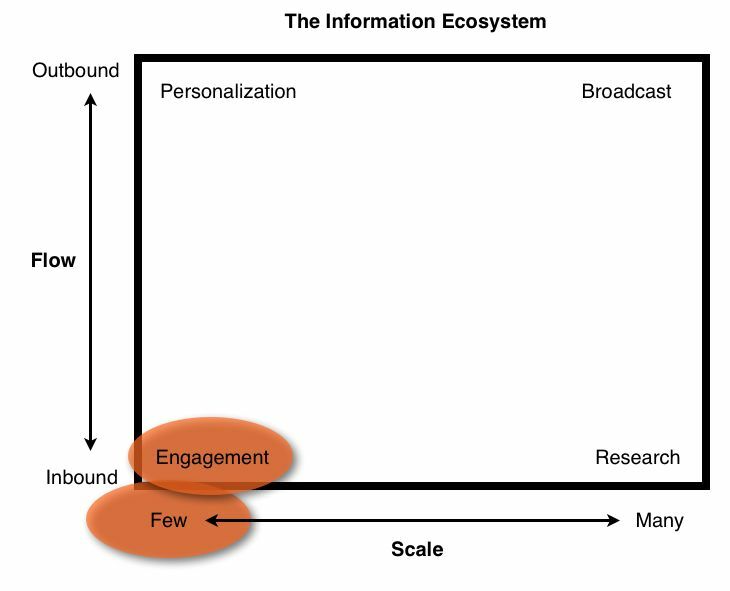 The inverse of broadcast is personalization — still an outbound flow, but a tailoring of information to the one or few people who receive it. Your Christmas cards, Amazon.com’s dynamically rendered e-commerce page, the direct mail on your counter are all attempts of various finesse to create the illusion of personal response; but it’s still an outbound push. Personalization is a valid strategy if you have many different constituent groups with varied needs, and if the cost of personalization is offset by corresponding sales increase via personalization. Netflix personalizes because the content presentation on its website is economical vs. the increased sales and usage customized movie recommendations generate; Nike would never personalize sneakers, because the marginal utility of custom shoes would not offset the high production costs. 3. Research. If a business model can leverage inbound flow of information from a mass of customers as a primary differentiator from competitors, research is the valid tactic. 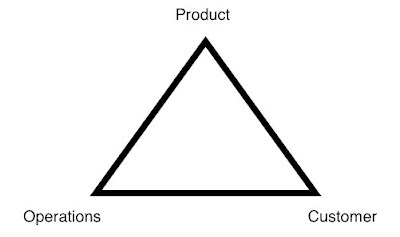 Typically this model only works for organizations that can repackage that group inflow as a key product, e.g. Pew, Arbitron, Nielsen, and Experian. However, many business-to-business consulting organizations such as McKinsey use inbound research as a key differentiator; management consultants who complete a deliverable for a European postal reorganization must also submit the findings to the internal knowledgebase, which can then be resold to other clients at hefty margins. 4. Engagement. And the last information strategy is the buzzword of recent years, “engagement,” the use of inflowing information from one or just a few customers. Engagement is valid only if your customer base has a high value skew — a wide range in value to you — or if small groups or individuals can wield great damage or gain to your organization. Ad agencies focus on engagement with their B2B client prospects, because one sale can build a new agency department. Financial service companies focus on engagement with their highest-value investors, because treating a Warren Buffett differently than Joe Sixpack can yield vastly different commissions. The more your customers differ in their needs from you and value to you, the more engagement makes sense. But as a core strategy, engagement only works if huge skews in customer value or influence are within your customer network. In this scenario above, a “few” have more value than the many — or a few have the ability to swing public perception about your company. Not every industry is like this — gas stations sell about one tank of gas each week to everyone — but others have enormous concentration of customer value or influence in their consumption base. Booksellers, airlines, high-end restaurants, hotels, coffee shops, and ad agencies all have some customers who use them much more than others, so treating this varied group in a different way provides value, differentiation, and competitive defense. The engagement choice makes sense if a small group of customers could wield positive or negative influence across the majority of others. This is why big companies such as AT&T, Ford or Dell have built social media command centers to engage with a few people to prevent hot spots on the negative side (popular bloggers pissed at a product incident must be managed) and to encourage influence on the positive side (why not invite people with huge Klout scores to the next product launch?). But for many companies, this idea may be overwrought; Klout scores in essence are silliness, and the idea that a small group of bloggers/Tweeters might disrupt a massive business such as Pepsi, or drive huge lift in Pepsi soda and energy drink sales, is suspect. It’s all a choice on how you compete. 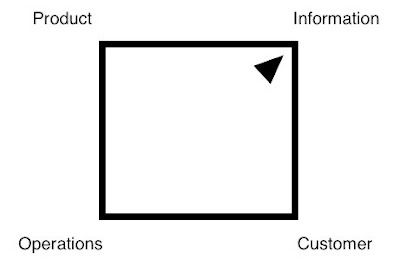 Pick your focus from product, operations, customers, or information. And if information is your weapon, pinpoint the corner of the Information Ecosystem strategy matrix that matches your customer structure. In your evaluation process, it is vital to distinguish information as a tool to be managed (and it must be managed by everyone) and as a weapon for competitive advantage (defined as going to market in a way that stymies competitors). Every organization may need a Twitter presence, research, broadcast, or some personalized content, just as you need a website; but information is only a strategic focus if its sets you apart in a way that builds barriers to competitor response. If products, or low prices, or total service do it better, information need not be your focus. Like customers, not all information strategies are created equal. If you follow triathlons you’ve heard of Team Hoyt, a father who is an incredible athlete and a son with cerebral palsy. The dad has pushed (on special bikes and strollers) or pulled (swimming, towing a boat behind him) his son through six Ironman competitions and more than two dozen Boston Marathons. It’s an amazing story, and the videos on their website www.teamhoyt.com will make grown men cry. Yet it beckons the question, why? We debated with some friends this weekend the meaning of Team Hoyt, and whether American culture in particular is becoming split between the weak and the strong, the TV-watchers and Internet intellectuals, those who sit comfy eating donuts and those who train to get their body fat down to 6%. Our society has bifurcated between the lazy and motivated. Could it be the lazy are now right? Sociologists suggest competition is one of four main forms of social interaction — the others being conflict, accommodation, and assimilation. Darwin said competition was fundamental, the struggle for existence without which species would not survive. Machiavelli said it was the root of society, a war against all. Adam Smith expanded competition beyond the individual to our collective market intelligence, an invisible hand that guides society’s balance and growth. All suggest the world is not in equilibrium, and as we seek resources for ourselves, we must grasp for more. Which poses an enormous conflict: If competition is good, and required to survive, and leads to progress, why does its fighting-against-others nature land at odds with the great spiritual and psyche beliefs of our time? Christianity’s turn the other cheek, Buddhism’s trascendental awareness, Maslow’s self-actualization at the top of the pyramid, and Freud’s Super Ego reigning in childish impulses all suggest higher levels of morality require turning competition off. Competition is a selfish impulse to pull ourselves ahead of others, to be faster, to gain more resources, to win fame, to succeed where others fail — and as such harms others, something truly civilized beings should not do. Could it be that competition may no longer be needed? Not long ago the world was a dangerous and brutal place. We are only a few generations removed from days when Roman soldiers went to war with sharp blades to hack their opponents into meat, when tribal victory meant killing all the other villagers, when disease could decimate cities and medicine was witchcraft. We still yearn to fight, because our parents had to. Like animals salivating at the scent of blood, we can’t turn the instinct off. If so, we are all small variables acting through competitions as physical forces in the great hive mind of human society. We’re subatomic particles that can’t help but be flipped negative with an electrical charge. We act like ants, rushing to lift more load, somehow building a colony whose purpose we do not see clearly. We hate conservatives or liberals, taxes or military, our neighbors or the illegal aliens from next door (who, we fear, may take more of our resources). We are driven by instinct to succeed, even if such success has no logical merit, even when we’ve reached a saturation point in resources where we no longer have to strive for food or shelter, even when the definition of success means taking something away from the other. It’s a beautiful thing, to strive so hard with so little logic. Team Hoyt, your journey confuses me. Inspired, I’m going for a run to beat some illusion in my mind. Ah, mimicry. DefaultCase.com is making hay off of Apple’s iPhone 4 reception troubles by running contextual ads online next to articles about iPhones. The banners are designed to look like official Apple ads (same fonts, layout style), and clicking through to the site offers a killer promise — get an iPhone case that solves your antenna issue for only 1 penny! The math is impossible, you say? Why, yes. Check out and the company adds $3.99 for shipping and handling. USPS tells us the cost to ship a 3 oz. package is $1.22, leaving DefaultCase with a nice estimated $2.78 for each small piece of plastic. Great case study in how to manipulate prices to convey value, while also riding a major company’s bad press. P.S. The site also suggests the cases are a $35 value. A touch of reference pricing to sweeten the deal. Yum.